Just wanted to let you know that our trip was absolutely wonderful. Everything worked out perfect and we enjoyed everything. The only thing we would have done different was to space a day between the long plane ride and going to a long day at Yosemite. A little tiring for us old timers but well worth it. The Wine Train was wonderful. We just had such a good time. Thanks again for planning our trip, you did an excellent job!!! I just wanted to send a quick email to tell you how wonderful the resort was. It was our favorite so far. Everything was great. Can’t wait to go back! Had an amazing time, absolutely worth it! The resort was wonderful and I had a great time in the rainforest. Definitely felt longer than a weekend, and I’d certainly do it again. We returned on Sunday and everything was very nice. We had a GREAT Time I really liked New Orleans. First of all, I would recommended the Windsor Court Hotel, very nice hotel! Great area, It was across from the Casino and walking distance to the shops on the pier very close to the ship. We stayed there after our cruise and just loved it. We did the City Tour which was excellent, we learned a lot about the city, wish we did it before the cruise because we would have known where to go when we got back. I would take another cruise from that port, better than Miami. Triumph was great and the 5 day was perfect. The two rooms with balcony worked out well. I really like Cozumel, we did a jeep ride for under $200.00 and was lead around the island in a caravan of jeeps. Excellent tour, we saw a lot and even got in Beach time. Progresso, was crazy. We did a bus tour of one of the Maya Ruins, very interesting and good tour. Then we shopped in the town, that was an experience we will never forget. Great buys on local merchandise but they hound you like I have never experienced before. Thank you again for another wonderful experience, we had a really good time. There are many reasons that the St. Lucian Tourist Board chose this branding for the island. Words lack to describe the beauty and serenity of the destination. Resorts are out of this world. 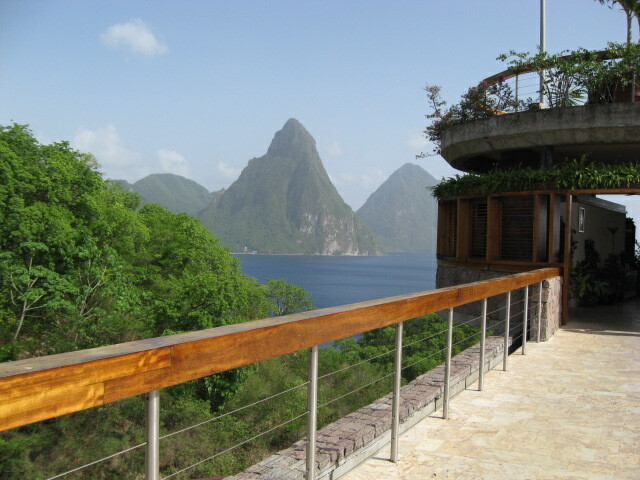 My visit to Jade Mountain proved why it was choosen for the Bachelor’s TV program. I don’t think they can find another location equally as romantic. The waters are blue, the rooms are amazing and the people shy and welcoming at the same time. WOW! is all I could say for the duration of my visit. Many thanks to Coconut Bay family resort (almost the only one) that concentrates on families, for hosting me and for the opportunity to share their perfect location. Please check us out on FACEBOOK and become a FAN! of Travel Encounters, to view my pictures, all 1335 of them! Get some coffee and relax with views of Simply Beautiful St. Lucia! We want to thank our loyal customers for shopping locally and especially with us!! Winter season was busy and we are so grateful, last year, as everyone knows was a struggle. This industry is changing dramatically from when I started years ago. We are vehemently keeping up with all the changes, especially with the airlines. Never know what curve ball you will get! Recently I attended a seminar on train travel. How fun is that! and you won’t have to go thru all that airline security. We did a short stint from Chicago to St Louis, which by the way was way too cute! So many renovated neighborhoods, the homes there are so beautiful. All the areas are within 5-10 minutes of a park walking distance. Wow! Wish that we had that here. They are trying to go green and the urban re-developement is in full force. Many older homes are being renovated and they are planting hundreds of new trees in the parks and revitalizing all the city areas. Back to the train experience. The cabins have been updated. They have sleeper compartments that can be for two persons and for families up to four can be accommodated by opening up a partition wall. They have a restaurant car which serves meals and snacks, included in the program. It was very nice. Lots of leg room, obviously because you can walk around anytime you wish! We have many itineraries to choose from, National Parks, New England, even a “no fly Hawaii” how ’bout that for the nervous nellies out there! There is a progam for the Great Lakes, Jazz lovers will enjoy the Memphis/St Louis/New Orleans itineraries. We have many more to choose from at reasonable prices and we can arrange for motorcoach transportation to the appropriate stations where the trains depart if someone chooses not to fly. This tours are especially attractive for groups. Call us to discuss this unique and comfortable way to travel. Just wanted to let you know we had a good time in Puerto Rico. We did end up renting a car and enjoyed seeing more of the island. Took a trip down the east coast, into small towns and swam and viewed the Caribbean side of things. My apologies for not getting in touch sooner – I wanted to let you know that we had a wonderful vacation in Mexico – seems like only yesterday, but it’ll be three weeks – yikes! Where does the time go? We really liked the Allegro Resort in Cozumel – previously we stayed at the El Cozumeleno (3 times), but definitely prefer the Allegro. The food was much better and the resort was more spacious (no fighting for beach chairs is always a plus). My husband is a diver and there was a dive shop on site which made it very easy and convenient for him. Other than that, it was a beach chair, chips and salsa and lots of margaritas! Weather was great everyday except one which was rainy and cloudy – other than that life was good. I will certainly be in touch for our next adventure. We try to get away every winter, although this was the first time in a couple years. Anyway, thanks again for everything! We were very pleased with both the Royal Lahaina and the Outrigger Waipoli for different reasons. At the Royal Lahaina, the room was gorgeous-I love Hawaiin decor. We loved that our view was part ocean and part garden including being able to see the golf course from the balcony. The restaurant was nice to have on the premises but the menu was limited except for the breakfast-their buffet was very good but even ordering from the breakfast menu was excellent. The parking spaces for the car were very, very tight, so most of the rental cars had dings all over the side panels!! We loved to watch the whales spouting while on our balcony but wish we had brought binoculars with us. Not only for whales but on both islands to really enjoy the sights. The condo on Kauai was marvelous. We felt we were living in a model home-cherry cabinets, stainless appliances, travertine floors, huge bathroom,2 balconies, very well equipped kitchen, etc. We only ate breakfast in. We did more beach activites on Maui but on Kauai, we loved the laid back feeling-went for a 2nd whale, dinner curise, saw the Grand Canyon of the Pacific, went to a coffee plantation, river cruise to the Fern Grotto, etc. etc. Kauai was having a drought-otherwise their rainy seaon is from Oct-March, I think. Convertibles were definitely the way to go!! Tom really hated the long flights-good thing we checked our flight when going to Kauai from Maui-the flight was changed to 45 minutes earlier and we did not know this, so would have missed our flight!! This is my first chance to drop you an email. Jim and I had a wonderful vacation at Iberostar Tucan! We loved the resort. Apple was very organized and things went very smoothly. Thanks, too, for all your tips, especially about those people in the airport for the vacation timeshares. That was one of the most valuable pieces of info we had! The resort itself was very clean and well maintained. The photos on various websites were helpful but the resort seemed nicer than the website photos. The beach was excellent — no signs of any hurricane damage. Staff and service was exceptional! I loved the jungle coverage and the animals — very entertaining. The jungle provided interest and shade and didn’t make it seem like it was a resort of a bunch of square buildings. Also, I liked everything being open air (except for rooms and specialty restaurants). We stayed on the resort and relaxed (no excursions) and because the service was good, we tipped (but only spent about $40. the whole time and $10. included a tip for my seaside massage!). -entertainment: I think American Idol rejects would be an improvement. Not the caliber of Royal Carribean’s cruise ship talent but we didn’t go for the entertainment. We often went just to see how bad it was — kind of like a Saturday Night Live skit. They did, however, have an 8:00 pm show for the kids. -food was average. Again, not like a cruise. But there was plenty of it. I never went hungry and was able to try a lot of different things. It was just kind of bland at times. -couldn’t get them to fix the coffee pot in our room. I think I language/understanding barrier. Don’t get me wrong, these are not negatives, just areas they could improve upon. None would prevent me from returning. Thanks for your expedited help. We aren’t normally impulsive but needed a break and this was great. You are currently browsing the Travelencounters Blog blog archives for April, 2010.